So far McKnight Group has created 88 blog entries. The variety of expertise attendees have can be very valuable to church leaders. For example, it’s a good idea to recruit people to your finance committee who have some understanding of debits and credits and how to read a spreadsheet. Some church leaders even invite worshipers to fill out a “time, talent, and treasure” inventory to help plug people into ministry opportunities that fit their skills and experience. This is also why we sometimes see church leaders putting people who have building or construction experience on church building committees. However, we don’t necessarily think that’s an important priority. This may be surprising to many church leaders, so we thought we’d explain our thinking. Why Not Make Good Use of Construction Experience? Certainly, it’s great to have a variety of perspectives on any church committee. This allows for the helpful discussions and eventual agreement. It can also be beneficial to have a member of your church building committee that has a passion for construction — but they should also have a passion for the vision of your church if they’re going to be a useful member on your team. In other words, construction experience is secondary to a church leader who knows about your church’s various ministries and where the church is headed. You will be hiring an architect and general contractor, or a design-build team like The McKnight Group, who will guide you through the church design and construction process. It’s sometimes useful to have a church leader with construction experience on the building committee, but it’s not necessary. Instead, it’s crucial that every member of the church building committee is focused on your church’s vision for ministry in your community and how a church building might help accomplish those goals. This doesn’t mean that there are no specific, useful talents that can benefit a church building committee. We do recommend, for example, that at least one member of your finance committee be a member of your church building committee. As mentioned above, they should also be familiar and on board with your church’s vision. (You don’t want someone working at cross-purposes with your church building project.) But you do need a financial representative who can remind you of what’s possible for this stage of your church building project, given the realities of your church’s financial situation. So, when it’s time to put together your church building committee, do check your list of people who have financial experience, but don’t focus on who has worked in building or construction. Choose dynamic and visionary leaders, and if they happen to have building experience, that’s a bonus. Another bonus for every church leader is our series of free i3 webinars. These webinars can educate you on the latest ideas in church design and construction. We suggest that you sign up for our next i3 webinar on our homepage today. Recently, we completed a major series entitled Church Building Steps from Start to Finish where we discussed each of the steps needed to complete a church building or renovation project. One question that might come to mind before undertaking such a process is how are fees structured? For the initial church design, you will need an architect (or a design build team like The McKnight Group) to give you a basic plan, based on your church vision and ministry needs. How design professionals charge varies greatly. The fee for this will often be charged by the hour or as a fixed price, usually through a written agreement. Once you are satisfied with the initial design, you will need to complete the construction documents. The architect should price these once the basic design is complete and the building budget is estimated. 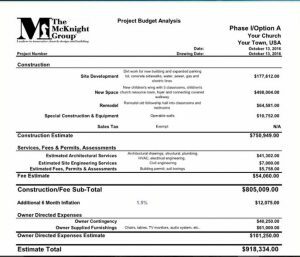 The cost of those construction documents will constitute the bulk of the architectural fees for your church building process. Next, you will move into the construction phase. In addition to the actual costs of the building (materials, labor, etc. ), there will be overhead and profit for the construction company that is doing the work. As building process moves along, periodic payments to the construction company will be required to purchase those materials and pay its team of workers and subcontractors. Here at The McKnight Group, we quote a firm price for the initial design. Then we calculate the cost for the construction documents during the design phase, based upon your actual church design. Once the construction documents are complete, we will give you a final guaranteed cost for the church building construction itself, and a timeline for when portions would be due, based on construction goals. Naturally, each church building project is different. This is one reason we offer our series of free i3 webinars. Each webinar gives you examples of what different churches are doing, which helps you understand what might be possible for your unique situation. We encourage you to sign up for our next i3 webinar and get the latest church building information we have to offer. Recently we completed an extended series of blog posts entitled Church Building Steps from Start to Finish, covering each of the steps that must be completed prior to moving into your new church. The series was a long one, but certainly not as long as it takes to actually complete the process. Which raises the question: Just how long will it take to complete a church building project from start to finish? On average a major church design and building project will take you from two to three years to complete. This includes all the steps we’ve outlined in our series. It also makes some presumptions about how long each step in that process takes, including the amounts of time the church takes to make decisions. Here’s one example of how a timeline can be affected at the permit phase. As we stated in our Start to Finish post on permits, it can take anywhere from a month to a year to get all the permits in line to begin construction. That is a wide variance. Although fifty percent of our clients have their permits in hand eight weeks after they begin the process, the other fifty percent will wait either a shorter or — more likely — longer period of time to get the permits they need to begin construction of their church building. Another component that can impact your schedule is funding. The best time to raise money for your project is in the spring or fall which means if you complete your church building budget in March, for example, you may not have time to do the necessary behind-the-scenes preparations for a spring funding campaign. It is more prudent to wait until fall (after folks have returned from summer vacations) to launch your campaign, thus slowing the final steps of your church building project. Because there are so many variables associated with the church design and building process, we create project schedules to help. It can easily show you starting and ending dates, depending on the variables plugged in for elements like permitting periods and when you expect to get your capital budget completed. If you are considering a church design and building project, please contact us at request@mcknightgroup.com. We will be glad to help you figure out the specific timeline for your church project based on the particulars of your situation. Clearly, every church building project is different. It’s why we suggest that you visit our homepage and sign up for our i3 webinars. Each of these free webinars explains different details on what you need to know in order to end up with a church design and church building that will meet the needs for ministry in your community. Our step-by-step series about church design culminates with the process of church building. After nine posts on necessary preparations, we talk about what you need to do during the construction process. A regular coordination meeting between the general contractor and designated church leaders is a key component to successful church construction. This weekly meeting addresses logistics, especially if the new church building or renovation project occurs on a campus currently used for worship and ministry activities. Topics from these meetings could include which entrances need to be available on Sundays (due to construction and safety concerns) and when water or particular restrooms might be shut off for hours, days, or weeks. These meetings also provide an opportunity for church leaders to note what needs addressing or cleaning as work proceeds. Many details from big to small need to be discussed and decided during the construction phase. These include interior design (including paint, flooring, and scheduling deliveries). Other important decisions revolve around keys: How many master keys will be available? How many different types of keys will be needed for different groups using different parts of the church building complex? The creation of a punch list (also known as the quality assurance walk-through) on your new or remodeled church building is a crucial indicator that your construction process nears completion. You and your general contractor will tour the church building, room by room, and identify anything that’s not correct, needs fixing, or is not yet installed. Those items are added to a list, and you will sign off as each item on the list is addressed and resolved. The move-in period is a time when you and your team will learn how to operate the systems in your new church building. Some folks will need systems training in operating the thermostat and HVAC system, while other team members will learn about the audio-visual system. Your general contractor will give you all of the maintenance and operating manuals associated with the various systems in your building, as well as a set of marked up drawings of any changes to the initial building design as it has been constructed. Finally, your general contractor will give you a warranty for the building construction that includes the builder’s commitment that they will address any issues that arise once you use the building. Although every general contractor intends to do their job perfectly, issues arise. The warranty is a critical component to the successful sign-off on a completed church building project. In our next post, we’ll move beyond the steps and address the best timing for your church building project. Meanwhile, please visit our home page and register for our upcoming i3 webinars. As you can see, we share a wealth of information with you in these free webinars! We are coming down to the wire outlining all the steps that you will need to follow for the successful completion of a church building project. Beginning with clarifying your vision for ministry in your community, we’ve discussed zoning, building codes, utilities, funding, and a number of other elements that come into play. Most recently, we addressed the various permits you will have to apply for and how long that process can take. In this post, we’re going to review the final steps that must take place before construction can begin; the bidding and pricing timeline. There are two different ways that the pricing stage can unfold, depending on whether your church design has been drafted by a standalone architect or one who is a member of a design-build team. If you have worked with a separate architect, you will need to take the same plans that you’ve submitted for permitting and send them out to various general contractors for bidding. If you’re working with a design-build team like The McKnight Group, we will take those plans and reach out to the various subcontractors and suppliers to negotiate pricing. If you didn’t go the design-build route and are soliciting bids from separate construction companies, there are services that can assist with the bid solicitation process. Either way, once the bids come in, you will need to review the contractor quotes, checking them for accuracy and differences. Once you’ve chosen your general contractor, you will need to sign a contract with them. At this point, you can also go back to your lending institution and close the construction loan. Don’t expect construction of your church building to begin the day after all your contracts are signed. The contractor and subcontractors will need time to mobilize, which means getting both labor and materials in place to begin the work. As we discussed in our last post, two phases—permitting and pricing—will often happen concurrently. While you’re waiting for various jurisdictions to approve your plans and issue your permits, you can be finalizing a construction contract, giving contractors time to get their teams together. The amount of time it takes to get those teams together varies widely from project to project. In 2018, the construction market was extremely busy. Most frequently, construction began a month or two after the contract was signed. However, there are seasonal fluctuations and the construction market can change. It’s possible that it will take a month or more to get work started on your church building project, but it’s also possible that work can begin in just a week or two. It all depends on the pace of construction at the time you begin. At this point, we’ve covered the first ten steps in our start-to-finish series. Finally, we are ready to begin the construction process itself. So, stay tuned for the next installment in our series of church building steps. And now’s the time to hop on over to our homepage to sign up for our next informative i3 webinars, which provide the latest free information on church design and building trends and ideas. Happy New Year! We hope your church and ministries will be blessed in 2019. We also hope that, if you’re looking for church building or remodeling support, you will look to us. One way we can help is through our no-cost i3 webinars, which provide ideas, insights & innovations (those 3 i’s) for your church building project. Each webinar is presented live, so we’re giving you a preview of what’s to come so you can mark your calendar now. In fact, you can already register for the first three of our 2019 i3 webinars right at the bottom of our home page. Plan to join us to learn about church design and building and to get your questions answered! Church buildings age, just like humans do and can become out of step with twenty-first-century needs. In this first webinar of 2019, our President, David McKnight, will examine some obstacles faced by actual churches and share how we helped transform their buildings to support their modern ministries. What goes inside your church building is an important, and sometimes overlooked, part of any successful church design. In this i3 webinar, our interior designer, Jennifer Snider, will discuss colors, finishings, floorings, and more; explaining what’s involved in a vibrant interior design so that your church building remains attractive to members and guests years after it is built. It is said that the only constant is change. This is definitely true in church design across the U.S. In this i3 webinar, our Vice President of Architecture, Philip Tipton, will outline what changes he’s seeing in technology, building design, and other key areas which can make your church an attractive worship space and compelling focal point in your community. David McKnight returns to talk about the realities of saving money on a church building project in this webinar. It’s hard to know what tips will really save you money in the long-term. Along with tips that work, David will examine several ideas that are advertised as money-saving options, but could really cost you more in the end. Any big project requires a good road map and actionable timeline. In this i3 webinar, David McKnight will outline each of the steps that should be on your church building road map (and warnings about potholes that you might encounter along the way), giving you a start-to-finish big picture that can help you stay on task through this months-long process. One of the most effective ways to attract people to your church is focusing on children. If your church building is appealing to kids, they’ll ask their parents to bring them to church. In this webinar, David McKnight and Jennifer Snider team up to talk about how your church design can appeal to children, and what common mistakes to avoid. How might tariffs, rising interest rates and other economic uncertainty impact the church building project of your dreams? Don’t worry; church leaders are still successfully funding church buildings and facility renovations, even in less-robust markets. In this webinar, David McKnight will help you think outside the box on making your church design dream come true, as well as providing tools for constructing a realistic budget to support it. Security is important for every church leader these days, whether it’s to keep children, members and guests or church staff safe. In this i3 webinar, David McKnight and Philip Tipton team up to discuss how building codes and security can dovetail, outlining ways that security that can be designed into your church building to meet various types of threats. In this webinar, Philip Tipton will talk about some principles behind successful church building projects and the common pitfalls that can set you behind before you even really get started. With Philip’s input, you can get your leadership team, church vision and ministry in the community off on the right feet! In our final free i3 webinar of 2019, David McKnight returns to reinforce what we believe is the core foundation of any successful church building project: a clear church vision for ministry in your community. Without it, your church building will never be used to its full potential. Join David in a discussion about articulating your vision and using it to design a dynamic facility that will support your specific church ministries. That’s the list of what you can look forward to in 2019. We hope you’ll attend all these webinars, and in between we’ll keep you informed through our blog on many of the key ideas, insights and information you’ll need to design and build the ideal church for your community. Though we are covering the church building process, step by step, it’s important to note that not everything involved follows a linear order. In some steps we’ve discussed, lots of tasks can be accomplished at the same time as other ones. While the main task now is getting the funding for your new church building or church remodeling project, it’s also time to get the right permissions to begin construction, and that means building permits. When it comes to permits, we need to note one thing. Each city and town is different in terms of its permitting process. In most cases, zoning requirements must be addressed before you can apply for a building permit. Now, in rare cases, you might be constructing a church building on county, instead of town or city, land, where there is no municipal jurisdiction. In this case, you may not have any zoning restrictions. That’s good news, because you don’t have to go through the zoning process, but it also could mean anyone can build something right next door to your church that might not fit in with your church’s vision for the community. How Long Can It Take to Get a Church Building Permit? The permitting process can take anywhere from a month to a year—it all depends on the size of the municipality and the process involved. A general rule of thumb is, the larger the city, the longer time you need to allow. We have found that, on average, 50 percent of our clients receive their building permit within six to eight weeks of application submission. But, many in the other 50 percent wait longer. What Is the Building Permit Process? Once you have submitted your church building permit application, most states require that your jurisdiction respond to you within thirty days. This does not mean you’ll have an approved permit within thirty days. Most applications are not accepted the first time around. Instead, the jurisdiction will submit a “correction letter,” which asks questions and requests clarification about various aspects of your church design plan and construction documents. You will need to respond to those requests for additional information before your building permit can be approved. You don’t have to be twiddling your thumbs during this time, however. Instead, you can also be reaching out to various building contractors for bids on your church design and construction. We will talk about bidding more in our next installment of this step-by-step series. However, in our next post, coming at the first of the year, we’ll take a quick break from this series and fill you in on all the planned i3 webinars in 2019. We’ve already listed the first few on our home page, so you can sign up now. Meanwhile, we wish you a happy and holy Christmas and joyous New Year. There are many steps to a successful church design and building process. Without paying careful attention to each one, you can end up with a church building that doesn’t meet your needs. So, we’ve been covering all the steps on our blog, from start to finish. Once you have your funding plan in place, it’s time to generate the construction documents that your church building professionals will need to bring your vision to life. During the design phase it was important to plan from your church’s vision. In the construction document phase, we keep the vision in mind but expand it to create a very detailed level of how things work. Each of these detailed plans make up the construction documents. Here are the various types of architectural and engineering documents that will need to be developed. Civil Engineering: These documents address the property beyond your church building. Engineering designs will address storm water drainage, parking lots, grading (so that water drains through the storm drain system rather than pooling on areas of the property), water and sewer lines outside of the building, and driveways that tie your parking areas to the roads that run adjacent to your church property. Structural Engineering: These construction documents cover the specific designs of every part of your church remodeling or new building project. In addition to the walls, ceilings, and floors, these drawings must coordinate with water and sewer lines inside the building, the HVAC duct runs, the locations and specific dimensions of elevators, stairwells, doors, windows—the list can seem endless at times, but each element matters. Electrical Engineering: These documents show the type of electric power service, size of the service and distribution of power through your church building. Besides the basics of lighting and the powering of appliances, you also need to consider where you will want to run audio-visual lines, security systems, your computer network, and your Wi-Fi system. HVAC Engineering: The type and size of HVAC units, and their location needs to be documented. Also, plans for the size of duct runs and their distribution to each area of the building are included. All the HVAC plans must coordinate with the power requirements in the Electrical documents. Plumbing Engineering: Plans will be needed for the types of fixtures, route and size of sanitary lines and water. A gas line, if applicable, will need to be coordinated with HVAC and other equipment. Interior Design: This is also the stage when you will begin to discuss the specifics of your church building interior design. Where do you want carpeting versus stained concrete or other flooring types? What color schemes will be used on the walls and ceilings? What type of wood will be used for cabinets, counters, and doors? These construction documents are all necessary for the next step in your church building process: gaining permits for the construction process itself. Until you have those permits in hand, you cannot begin work on your new church building. We will discuss the specific types of permits and approvals you will need in our next post in this start-to-finish series. Speaking of what’s next, we’ve just announced the first three topics for the 2019 free i3 webinar series. You can check them out by visiting our home page and be sure to register and mark your calendar for the ones you want to attend. Then, watch our blog. We’ll preview all the upcoming webinars for 2019 in January. As we continue working through the church building process step by step, it’s time to talk funding. You should now have a good sense of how much money will be required to complete the church building process from the budget developed in the last step. Now it’s time to figure out where that money will come from. Obviously, you will need to ask for the funds required to fulfill your ministry vision of a new or remodeled church facility. The funds will come from three basic sources: gifts, pledges, and financing. In order to raise funds in a responsible manner, you will need to plan your stewardship campaign in a wise and thoughtful way. Whether you have knowledgeable attendees in your church who can conduct this campaign or if you hire a consultant (recommended in most cases) to guide and support your efforts, there are some basic elements that will need your attention up front. There are certain key elements to a successful stewardship campaign, and one of them is good timing. You don’t want to raise money in winter because between the holidays and winter vacations, people are distracted by everything else going on — and are likely spending more money than usual, which could make them feel they don’t have funds available to support your church building project. Summer is also not a good time for a stewardship campaign because many people are away on vacation. Therefore, the consensus of opinion is that the best times to ask for gifts and pledges for your new church design and building project are in the spring or the fall. Financing is an integral element of almost every church building project as raising enough money through gifts and pledges isn’t always possible. It’s important to begin thinking about the financing early, as there will be much financial information you need to gather in preparation for making the loan request. Here is a handy checklist of the different types of materials that you will need to have available when you begin conversations with lenders. You’ll also want to find a lending institution that has worked with churches before. There are some elements to financing that are specific to churches. Lenders who are not familiar with the differences between thriving and struggling churches, for example, might tend to bundle all types of churches together. This can lead them to offer you either too much or not enough financing than your church’s financial health can truly support. Much of this funding work can — and should — begin concurrently with the earlier, church design phase. It’s never too early to get a sense of what you can afford and how you will make that church design into a reality. Stay tuned for more, as the next step in our start-to-finish series will address construction documentation. It’s also never too early to tell us what else you’d like us to cover in our free i3 webinars. Our 2019 webinar series topics is almost done, so please contact us at request@mcknightgroup.com to let us know what topics and questions you would like us to discuss. This step in our Start to Finish church building series wraps up the church design phase. It’s a very important step because you must be able to afford the new church building or remodeling project you have so carefully designed. A well-thought out budget will not only tell you if your project is affordable, it will also let you know how much money you will need to raise when the time for funding arrives (in our next step). Many church leaders just focus on the construction costs for a church building as if that is the only part of a budget, but there’s more to it. You will also need various permits and pay several fees during the process of approval and construction. If you’re creating a new church design from scratch, you will have expenses involved with preparing the building site for construction. If you’re remodeling an existing church building, costs will be associated with making sure that the old building meets newer building codes and safety restrictions. The Cost of Construction. The largest and most obvious part of the budget includes site development (preparing the ground, installing utility lines, laying in pavement and sidewalks) and the construction itself. Whether you’re starting a new church design or embarking on a remodeling project, construction includes everything that could not be moved if you were to vacate the building, such as the HVAC system, elevators, paint, and movable walls. Fees, Permits, and Assessments. These costs cover the requirements to create a church design that meets applicable zoning and building codes for your city. They include soil testing, building permits, and the various types of architectural and engineering drawings during construction as well as permitting once the building work is complete. Contingency and Inflation. These numbers reflect the likelihood of changes during the course of the project. While everyone hopes that the approved church design will be final, things come up because of the church’s vision and the realities of construction; changes have to be made. We suggest that every responsible project budget include a contingency figure and account for the cost of inflation for construction materials and labor over the course of time it takes to start the construction project. The amount of contingency you set aside depends upon the type of project you are proposing. Current inflation for the last 12 months has been near 6%. Owner-Supplied Furnishings. A new church building is great, but an empty shell will not support your vision for ministry in your community. Once the construction phase is complete, you will need to supply furnishings—everything from tables, chairs, and audio-visual equipment, such as screens and speakers, to kitchen appliances and nursery cribs. Once you have well-researched estimates for each of the four budgetary elements above, you are ready to move into the second phase of the church building process, which secures funding for your church design project. In the next post of our Start to Finish series, we will discuss these various elements of funding. This step-by-step series is inspired by one of our 2018 free i3 webinars and we are currently outlining our 2019 webinar series. If there are topics you would like to see addressed, please contact us at request@mcknightgroup.com.